Dim Sum and Mormons...the stuff that dreams are made of. Admittedly rather strange and twisted dreams...but never mind! Living so close to London means there isn't much we haven't seen and some shows we've loved so much we've gone back for a return visit (is seeing Wicked 7 times a little excessive?!) therefore its always exciting to see which show Mum has picked for us. The Book of Mormon is something I've wanted to see from almost day dot. My first run in with the show was when the Bath Student Musicals Society (BUSMS for short) performed 'I Believe' in their yearly variety show 'Encore!'. It bought the house down not only because of the wonderful performance but because of the show's unusual choice of subject matter and the ballsy hilarity with which the lyrics bring it to the stage. From that point on, I had to know more about the show then a smash hit on Broadway and soon to be previewing in the West End. After watching the amazing Broadway cast rock 'Hello' at the 66th Tony Awards in 2012, I knew I had to see it live. We tried to no avail to get tickets for my 21st birthday during the preview run - a sell out, the performances were met with rave reviews. I absolutely squealed when I found out we were finally going....needless to say I had MASSIVELY high expectations of the West End Cast. Before the show (the Saturday matinee), we headed over to China town for Dim Sum, a Chinese equivalent of tapas for those not in the know. I've been to Joy King Lau before and their service is always so quick and efficient...we were on limited time (too much time spent sale shopping in H&M - sorry, my bad) but to our amazement even with a queue snaking out of the door and half way up the stairs we were in and out within half an hour. In such close proximity to Leicester Square and Picadilly Circus, this is the perfect place for a transition lunch between Covent Garden and Oxford Street. The trouble with Dim Sum is that its a minefield of dumplings, dishes and noodles and rice - I don't often know where to start. As my Mum comes fairly regularly on work lunches here, we let here weave her magic whilst slipping in a few suggestions of our own. As per Chinese tradition, the youngest of the table poured the Jasmine tea...she did better than I would have - It would have been everywhere if I'd gone near it! A few quick snaps of the food - most of it was gone quicker than I could photograph it. I am a rubbish food photographer - my favourite dumplings (the scallop ones - to die for, literally!) were gone in less than one bite...my poor lens didn't even get a look in! The table was certainly in a bad state when we left it...ah well, at least they knew that we enjoyed our meal. By the time the curtain fell on the first act, I wasn't quite sure what I had just seen - stunned is the word. But something told me the first blasphemous act was not as crazy as it was going to get. Written by the makers of South Park, the script certainly does not take in to account the blushes and humour fueled outrage it will cause the audience. Like Avenue Q (on which Robert Lopez also collaborated), it is beyond me how they manage to get away with putting their content on the West End. Whatever powers that be that allow such things to go on, I thank them because The Book of Mormon is truly a revelation! 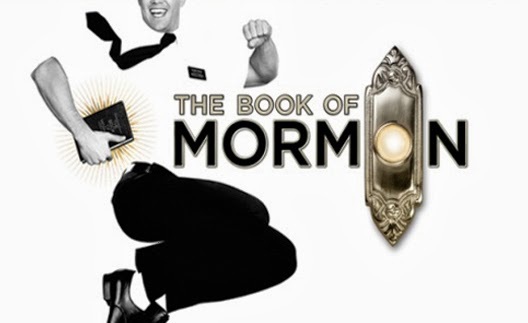 From Ugandans cursing Gods name and reenacting fictitious sexual acts with frogs to the campest group of Mormons I have ever seen turning off their gay feelings 'like a light switch', with every song the show gets more and more risque and more and more hilarious. I have never been so outraged and never given heartier applause. There is a reason The Book of Mormon won The Times Best Night Out award! I did wonder, however, what Mormon's themselves thought of the whole thing - seeing as it kind of defaced their entire religion! Judging by the 3 pages of adverts they put in the colour program, I guess they see the statement 'Any publicity is good publicity' to be true! The Book of Mormon - I couldn't recommend it more!